is there a way to back-track a blog post? cuz i'd sure love to pretend i didn't forget to blog yesterday but wait, i did. yesterday and today and every day, i'm thankful for: my job. yup, i said it... it has its tough moments, challenges, politics, gossip, morons, white trash, smelly people, stress, gray hairs and days where i sometimes think i'd rather be anywhere else. but the truth of the matter... the really big picture... is that i'm blessed to be doing something i love, advocating for children (albeit indirectly) and getting to use my creative license to make things happen for over 400 charities across the country. i've had experiences in the last 5 (eeeeek!) years that some will never have in a lifetime, and i'm grateful for that. when i move on from this place, i know i'll appreciate the person it has made me. phew. that was kinda tough. today i'm thankful for: pandora. i can't imagine a better way to get through the work day than to have a customized playlist of songs - new, old, and never-before-heard - streaming for eight solid hours. you can bookmark your favorite artists, check out other listeners' playlists, and give songs a "thumbs up" or "thumbs down" that clues the station in to whether or not you want to hear it again. you can even mix it up and select various types of music to hear throughout the day. in case you missed it, i'm blogging a month of thanks. check out my first post here. nine days in to the month, i was inspired by several other blogs to celebrate the season by blogging every day during this "month of thanks". every day i stop and think about things i'm thankful for, so why limit that to my own thoughts? i'm going to try and share it with the interwebs and if i inspire just one other person to reflect in this way, my job is dunzo. today i'm thankful for: water. don't ever underestimate its power! one billion people in this world don't have water. that's one in six of us. one of my favorite charities in the world is called charity: water. they have a simple mission - to bring clean, safe drinking water to people in developing nations. what they've done in a few short years is astounding and at the center of it all, they're providing one of the most basic human needs to the most desperate of people. 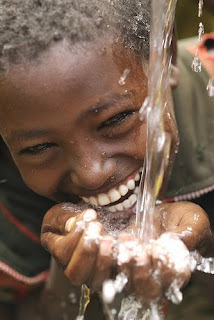 the photos and stories that come out of charity: water are incredible. so go have a glass and enjoy every last sip of it... because you can.